Wikipedia offers some interesting tricycle information. Quoted below is a portion from the Wikipedia TRICYCLE website, which you may find interesting. Please visit the Wikipedia Tricycle page for further information and photographs. Tadpole (or reverse trike), a recumbent design with two steered wheels at the front and one driven wheel at the back (though one model has the front wheels driven while the rear wheel steers). Steering is either through a single handlebar linked with tie rods to the front wheels’ stub axle assemblies (Indirect) or with two handlebars (rather, two half-handlebars) each bolted to a steerer tube, usually through a bicycle-type headset and connected to a stub axle assembly (Direct). A single tie rod connects the left and right axle assemblies. The tadpole trike, which is rapidly becoming the most popular design, is often used by middle-aged or retiree-age former bicyclists who are tired of the associated pains from normal upright bikes. With its extremely low center of gravity, aerodynamic layout and light weight (for trikes), tadpoles are considered the highest performance trikes. Adults may find upright tricycles difficult to ride because of familiarity with the counter-steering required to balance a bicycle, in which the weight of the body is used during turns. The variation in the camber of the road is the principal difficulty to be overcome once basic tricycle handling is mastered. Recumbent trikes are less affected by camber and, depending on track width and riding position, capable of very fast cornering. A few trikes are designed to tilt into the corners much as a bicycle does, and this also renders them more comfortable on cambered roads. They are referred to as tilting three wheelers (TTW’s). In the case of delta tricycles, the drive is often to just one of the rear wheels, though in some cases both wheels are driven through a differential. A double freewheel, preferably using no-backlash roller clutches, is considered superior. A jackshaft drive permits either single or two-wheel drive. Tadpoles generally use a bicycle’s rear wheel drive and for that reason are usually lighter, cheaper and easier to replace and repair. Typical upright trikes for adults have front and rear brakes. The front brakes are usually “pull brakes” or V-brakes, and the rear brakes can be pull brakes or internal drum brakes (which operate like automobile drum brakes). Recumbent trikes often brake one wheel with each hand, allowing the rider to brake one side alone to pull the trike in that direction. This has led to a geometry (also called centre point steering) with the kingpin axis intersecting the ground directly ahead of the tyre contact point, producing a normal amount of trail. This arrangement, elsewhere called “zero scrub radius” is used to mitigate the effects of one-sided braking on steering. While zero scrub can reduce steering feel and increase wandering it can also protect novices from spinning out and/or flipping. The alternative is to use standard Ackermann steering geometry, perhaps with both front brakes operated by the stronger hand. While the KMX Kart stunt trike with this setup allows the rear brake to be operated separately, letting the rider do “bootlegger turns”, the standard setup for most trikes has brakes for each side operated by each hand. Trikes’ strongest suits are cornering, stability, comfort, rider stamina and terminal velocity. Trikes can be used by adults who have problems riding bicyles. As well, trikes are a good choice for elderly riders who are worried about falls. Trikes can ride and climb at very low speed and a kickstand is never needed. Trikes are always heavier than bikes of the same quality. In fact, the lightest commercially-made tadpole trikes, at around 30 pounds, are easily twice the weight of an upright bicycle of the same cost and quality. Deltas are even heavier. Shortcomings that potential tadpole trikers should realize center on the low riding position which makes them difficult to mount (grab handles are often available) and makes them hard to see in traffic, so flags and blinking lights are often used. Visibility concerns become minimal on bike trails and off-street riding. An often-noted problem with recumbent trikes, much debated by trikers and recumbent riders of all kinds, is their poor climbing ability: the rider cannot get out of the saddle and stand up on the pedals to climb hills. Trikers argue that they make up the time lost going up hills by going much faster on the downhill side because of the low, aerodynamic riding position. Makers of upright trikes include George Longstaff, Higgins, and Pashley Cycles in the UK. Italian company Di Blasi make a folding upright trike, which folds to a compact 68 x 28 x 62.5 cm. There are also many inexpensive, mass-produced upright trikes available through mass-market retailers. They are generally heavy and of uneven quality, but are suitable for occasional, low-demand riding, especially by those with mobility problems. Makers of recumbent trikes include KMX; Hase (who make the Kettwiesel delta, improbably named after the British children’s programme Catweazle); Inspired Cycle Engineering, who make the Trice range of tadpole trikes; AVD, who build the record holding Burrows Windcheetah or Speedy, a design exhibited in the Metropolitan Museum of Modern Art (MoMA); Australia’s Greenspeed, one of the oldest manufacturers; Michigan-based WhizWheelz, which makes 10 models, including a sub-US$1000 model tadpole and a tandem; Big Cat HPV which builds the 8 Catrike models in Florida and Sidewinder Cycle which has a front wheel drive system with rear wheel steering builds 3 models all with Electric assist capability located in California. The largest manufacturer of recumbent trikes is Sun Bicycles who make both tadpole and delta trikes. The deltas are built from designs licensed from Gardner Martin’s EasyRacers, the premiere maker of recumbent bicycles. Sun bicycles are factory-made in Taiwan and are among the least expensive trikes of good quality. The least expensive adult trikes are steel framed upright models; the most basic models suitable for leisure riding or shopping start at about $300, and mass-market models tend to be in the $500 to $700 USD range. Mid-range trikes with better quality parts and more features are in the $1000 to $1600 range. High-end adult trikes begin at about $2000 USD, with some models costing over $3500 USD. The first tricycle was built in 1680 by a disabled German man who wanted to be able to maintain his mobility. Since he was a watch-maker, he was able to create a tricyle that was powered by hand cranks. In 1789, two French inventors, Blanchard and Maguier developed a tricycle. 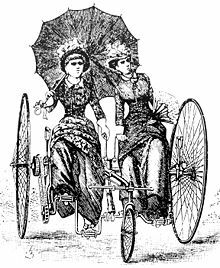 The Journal de Paris, noting that the new invention was different from the existing two-wheeled bicyle, invented the term “tricycle” to differentiate between the two human-powered vehicles. Tricycles were used by riders who did not feel comfortable on the high wheelers, such as women who wore long, flowing dresses. In the UK, upright tricycles are sometimes referred to as “barrows”. Many trike enthusiasts (“trikies”) in the UK belong to the Tricycle Association, formed in 1929. They participate in day rides, tours and time trials. Massed start racing of upright tricycles is limited to one or two criteriums such as in Bungay, Suffolk each year. Please visit the Wikipedia Tricycle page for further information and photographs.